The Nexus 6P is a fairly substantial upgrade to the very popular Nexus 6. Thinner, faster, a little smaller than it’s predecessor, the phone has gotten some excellent press. The phone runs Android 6 on an octa-core Qualcomm Snapdragon 810 processor with 3GB of RAM. Excellent front camera specs at 12MP with laser autofocus and dual-LED (dual tone) flash. The front camera isn’t too shabby coming in at 8MP. The storage maxes out at 128GB but most will opt for the entry level 32GB which is double what you typically see from Apple these days. This compares real favorably to the best phones available from Samsung, Apple and other manufacturers. The phone is incredible thin. The size is 6.27 x 3.06 x 0.29 inches (159.3 x 77.8 x 7.3 mm). That’s right, it’s a quarter of an inch thick. I don’t know if that makes it susceptible to bending in the back pocket so be sure to purchase a heavy duty case and leave it out of your back pocket. The display size is a very respectable 5.7 inches which puts this into what I like to call phablet space. These specs are very important because they are needed prior to selection of a mount. The measurements given in this article are for a bare phone without a case or skin, so be sure to measure it if you are adding a case or skin. This isn’t a small phone so the average car mount may not open wide enough to accommodate the Nexus 6P. On the mount side, there aren’t any custom cradles known that are made for a Nexus 6P. We will be recommending universal holders that open wide enough to hold the Nexus 6P with or without a case or skin. The most popular place for mounting smartphones in cars continues to be the windshield. The Arkon Slim Grip Ultra Travel Mount is a mount that we have recommended before for larger phones such as the Nexus 6P. The cradle opens to over seven-inches which is easily large enough to hold your phone with or without a case. The included cradle has a spring loaded feature and legs which can be moved from side to side to leave any port on your phone available for a charger or audio cable. The mount will allow the phone to swivel into landscape or portrait mode. A useful included feature is an adhesive dash disk used to turn your windshield mount into one for the dash. This is nice for states that may not permit mounting to a windshield. We wrote a detailed article on this topic which can be read here. Another good mounting option is the car dash. The Arkon Friction Dash Smartphone Car Mount is an excellent choice for this location. This mount includes the same cradle as we just discussed. The one that opens to 7+ inches. There is an included heavy dash mount that is removable. This weighted dash mount is different from others in that it includes a safety anchor to maintain stability. The safety anchor is a small hook with an adhesive base and the weighted dash mount has a small loop that fits over the hook. The use of the safety anchor is optional but I recommend using it for added safety. Using an application like Waze on your Nexus 6P makes for an excellent GPS. We always liked using a car vent for mounting a smartphone in GPS mode. 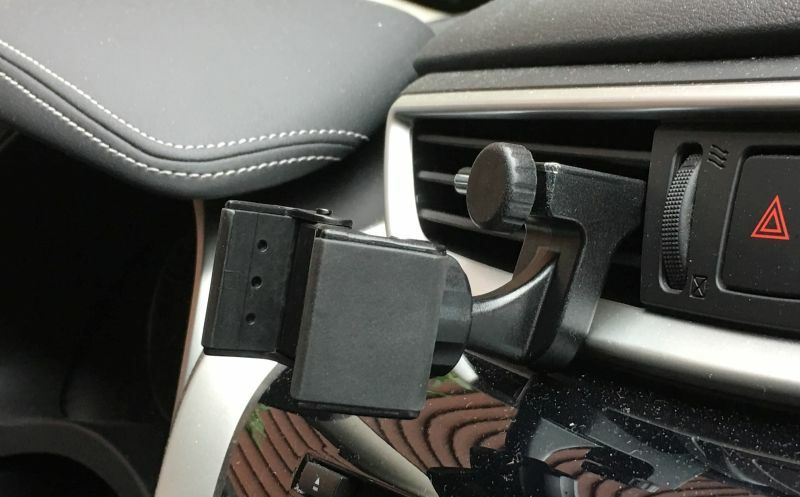 The photo with this article is the Square Jellyfish Jelly-Grip Car Air Vent Mount. The Square Jellyfish Jelly-Grip mount can be used to hold most phone models with or without a case or skin. It has a ball and socket so the cradle so has the capability to be oriented downwards towards the driver versus the roof. This mount will work on flat vent slats that are 3/8 to 1 inch deep. The included cradle opens to 3 5/8 inches which is large enough for this phone. We reviewed the Square Jellyfish Jelly-Grip earlier in the year. For motorcycle use, it’s important that you select a mount that has a well constructed cradle that is going to hold your Nexus 6P very tightly so that it stays put through the vibration of a ride. We continue to be big fans of the RAM X-Grip line. These are heavy-duty mounts mostly constructed of metal. The mount has gone through some rigorous shake tests and holds up well on a motorcycle. We wrote about X-Grips extensively on this site and you can view that article here. Most motorcycles can use the RAM X-Grip Handlebar Mount which features the expandable X-Grip IV cradle. This cradle will open up to 4.5 inches which is large enough for most cases or skins. In this case, the phone will be held by the sides. We always recommend tethering your device for added security and these cradles now come with an included tether from the manufacturer. This particular mount comes with a lifetime warranty from the manufacturer.